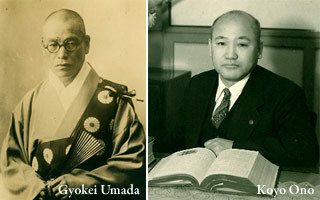 Gyokei Umada and Koyo Ono, both known as pioneers in the field of education for women, open Rissho kindergarten and Rissho Women’s School for Needlework. Rissho Junior College for Women is founded and the Faculty of Domestic Science is established at the college. Rissho Women’s University is founded in Koshigaya City, Saitama Prefecture. The Faculty of Domestic Science is established at the university. Rissho Junior College for Women is renamed Junior College of Rissho Women’s University. The Faculty of Education is established at Rissho Women’s University. The Faculty of Human Sciences is established at Rissho Women’s University. Rissho Women’s University is renamed Bunkyo University. Junior College of Rissho Women’s University is renamed Women’s College of Bunkyo University. The Faculty of Information and Communications is established at Bunkyo University. The Faculty of Information and Communications and the Women’s College of Bunkyo University are transferred to the Shonan campus. The Faculty of Language and Literature is established at Bunkyo University. The Faculty of International Studies is established at Bunkyo University. The Special Postgraduate Course is established at Bunkyo University. Graduate Schools and the Foreign Student Department are established at Bunkyo University. The Faculty of Health and Nutrition is established at Bunkyo University. The Faculty of Business Administration is established at Bunkyo University.